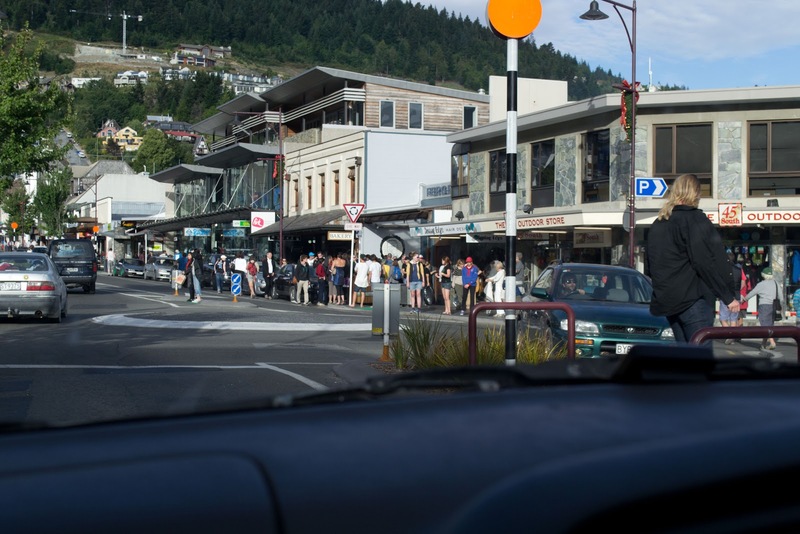 So Queens birthday weekend and I'm in Christchurch feeling a bit under the weather, what rubbish! Since I have no chance of getting out doing anything exciting this weekend I thought instead I'd write up an adventure I had at the very start of the year. 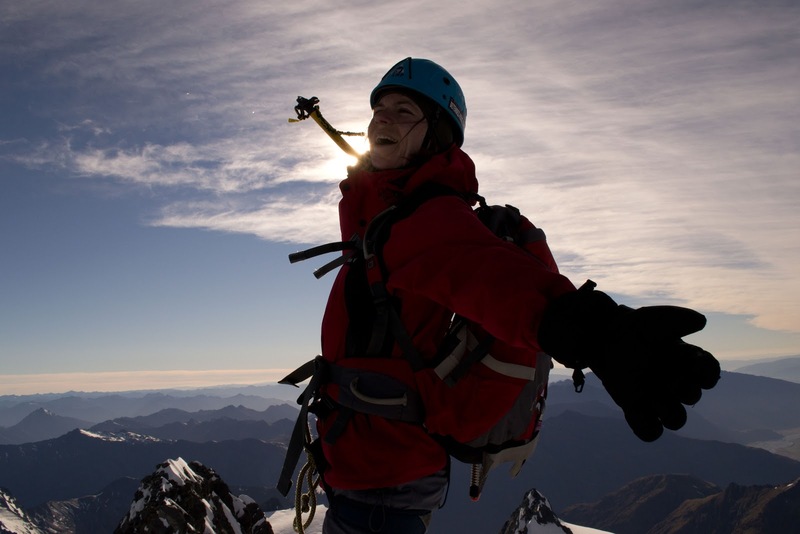 Alice, John and I met up in Wanaka after Christmas for an attempt at climbing Mount Aspiring. 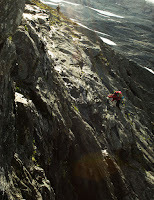 Two of my flatmates Mon & Oli were in Wanaka for rock climbing and tramping as well. Pouring over maps and discussing logistics at our camp site we decided on our adventures. There was some overlap for the first few hours of tramping into Aspiring Hut before splitting ways as Mon and Oli went to cross Cascade Saddle and make their way towards Queenstown. 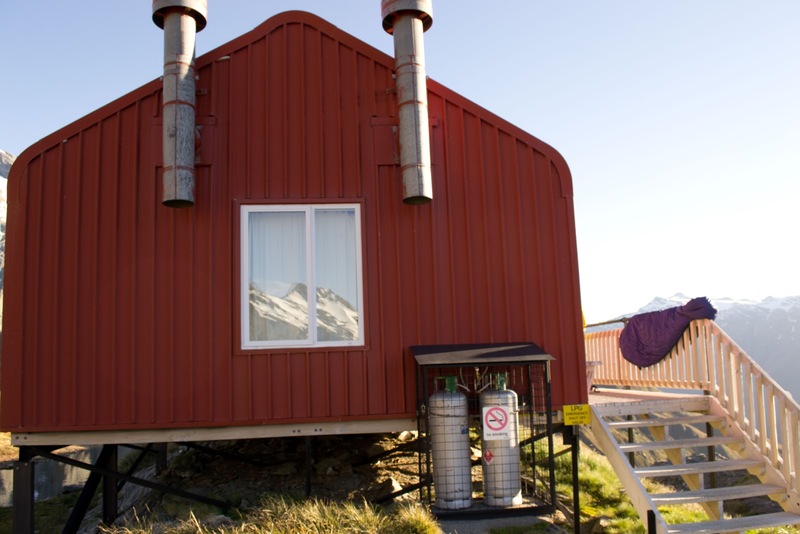 As we arrived at Aspiring hut a mountaineer was waiting for his helicopter ride up to Bevan Col. Naturally we made fun of each other - he laughed at us for walking such a long way in, and we laughed at him for being lazy. Still we left precise instructions with him regarding exactly what size steps we would most desire for the route up to the summit. 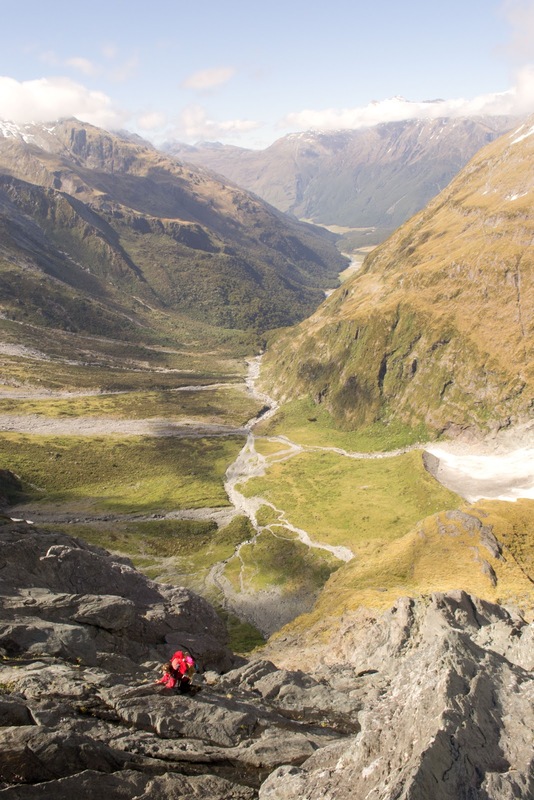 Our route took us further up the Matukituki valley and we camped where French Ridge meets the valley floor at Pearl Flat. Camping involved hours of running away from sandflies. An early start followed, us dumping anything we didn't want for the next day, including tent, and stashed it into the forest. Continuing up the valley we had breakfast at Scots Biv and had lunch at the end of the tramping - the very head of the West Branch of the Matukituki. The way up from there didn't look clear, but I had done this before. 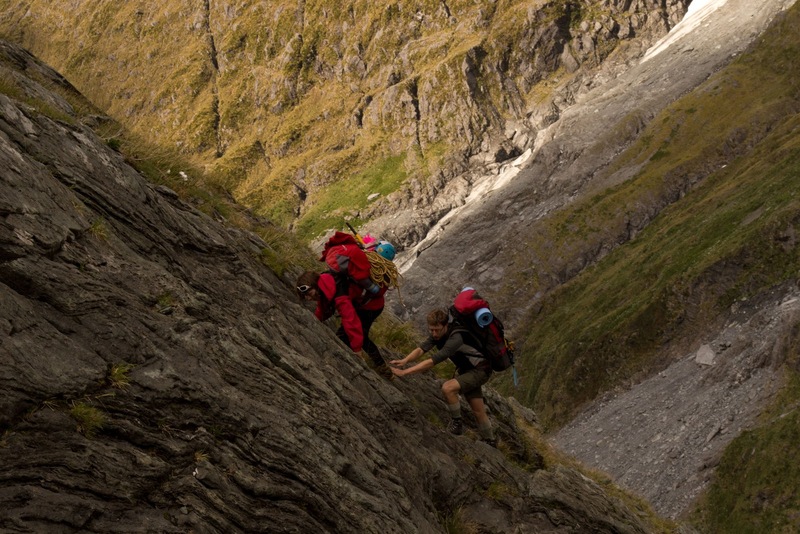 A steep scramble got us up to Matukituki saddle. I proceeded to get us a touch lost by siddling east to early onto steeper and steeper rock. More steep scrambling on our route eventually saw us up to Bevan Col where we could finally see our objective in all its glory! We stopped there for a while admiring the view, contemplating routes and generally getting excited. 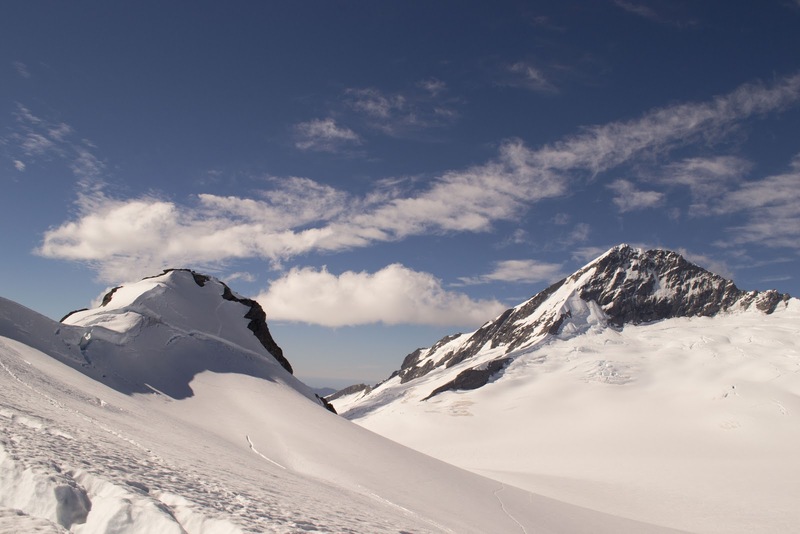 To get to Colin Todd hut from Bevan Col the Bonar glacier has to be crossed, this glacier travel meant roping up and getting the ice axes out and trudging through the snow in the sun. Counter intuitively this is excessively hot work. 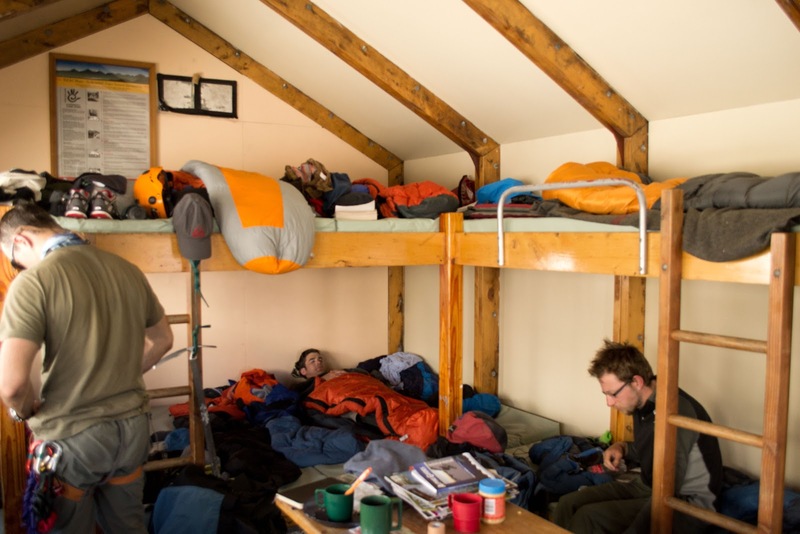 At the hut we found a crowd of people, twice as many people as bunks! Luckily the guided groups had tents and everyone seemed to give preference to those of us who had walked up, I wasn't going to argue with that! It stayed light until around midnight and my third of a bunk wasn't as comfortable as I'd have liked so I didn't catch any sleep before the alarms went off just before 3am. I think it didn't get properly dark until my alarm went of. So we got up and quietly had our breakfast outside to avoid disturbing people. 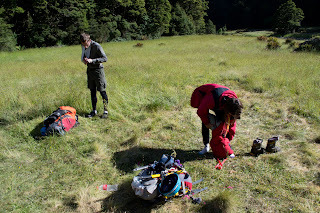 That good intent was somewhat shattered as we had to clamber through the hut getting ice axes, crampons, and other tools ready for our climb. None the less just after 3am we set off. The first couple of hours was very dark and very cold. With the rather big drops on either side of us, I really didn't enjoy it much until the light crept out a few hours later. 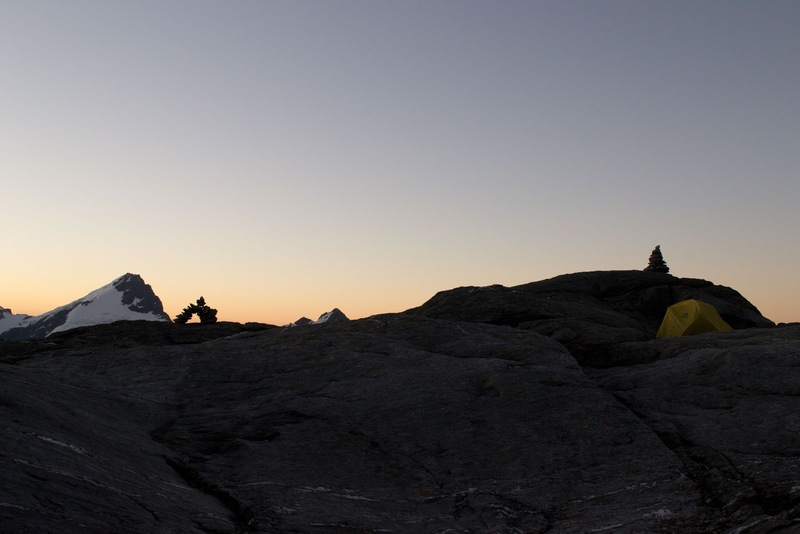 As we were climbing the first knoll, we happened to stumble upon two climbers in their bivy bags, sleeping en route. They got up in the glare of our headlamps, packed up and were away in the space of two minutes! "Turn your face to the sun and the shadows fall behind you"
As dawn approached life just got better and better. I was awakened as the sun emerged; I went from being in a constant state of fear, pumped full of adrenaline, to enjoying the prospect of a fun lightly laden day of rock hopping. With the sun up we made much quicker ground. I took turns at finding our route, some of the butresses forced us one way or the other - and some we could go straight over. The going was reasonable, we were pretty confident to climb without ropes the whole way unlike some of the other climbing parties. The time flew making our way up the ridge and before I knew it we were in the sun on top of Mount Aspiring enjoying the first day of the year! Alice busted a few choice moves on the chilly peak before my camera decided it was too cold. Climbing down off the snow cap we saw another few teams making their way up through the rocks. We took shelter in a bit of a rock biv for breakfast - gingernuts featured highly. 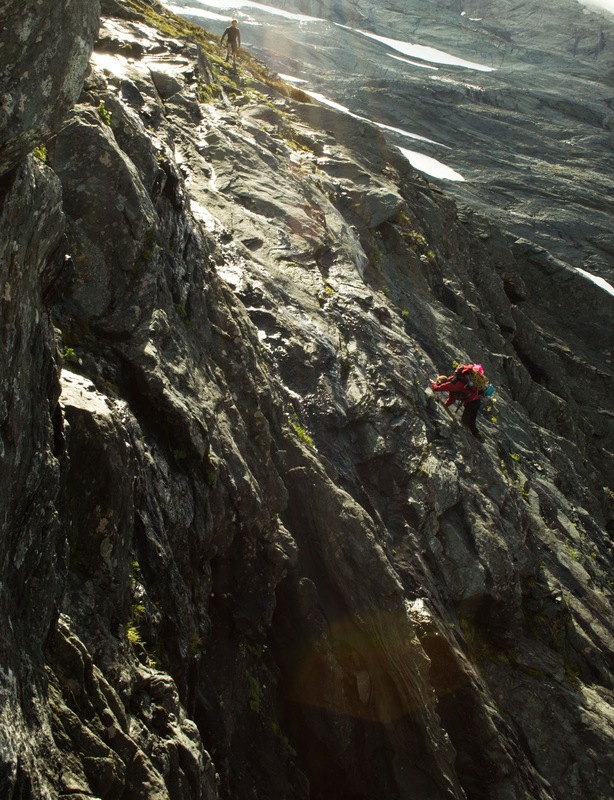 With the sun now up proper we took off our jackets and embraced the easy scramble down. The whole way back was not as smooth sailing as I'd hoped. 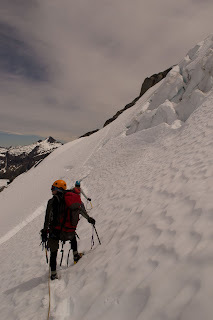 We decided to take "the kangaroo patch", a moderately steep section of snow above the bonar glacier that allowed a more direct route back to the hut - skipping point 2151. We were making great time, so we decided to take our time and practice pitching down the snow even though we were all feeling fine with just walking down it. It was lucky we were pitching because on the second or third pitch, John had just removed the top anchor when he slipped. I was belaying from a bucket seat in the snow backed up by my two ice tools. It seemed John was trying to self arrest but it just wasn't doing anything he kept gaining speed in his slide down towards the rocks and glacier below. The ice axe buried deep in the snow as a runner that was halfway down the rope popped out without seeming to offer any resistance. Alice and I shared a very frightened look as he slid past us. What he pulled behind him was perhaps the most scary thing for me. The point where all of his momentum would be transfer unto me via our rope was swiftly approaching. Alice was putting all of her weight on my two ico tools, thankfully buried deep in hard snow. The weight came on and yanked me out of my bucket seat before I knew it. Unadulterated fear shot through me as I hurtled away from the mountain. The force of John's tumble and now my added weight was transfered to my ice tool anchor, and thank everything they held. After recovoring my feet, I lowered Alice down to him. There was a trail of blood from snowburn and in total he had fallen/slid about 80m. I managed to locate a few items that had come out of his pack - and luckily found his glasses where they had come to rest meters from a small crevace. Alice and I both felt horrible, we had both stopped to put our jackets back on before we went onto the snow, and Johns injuries would probably have all been prevented if he had too. So crucial to note what team members are doing or not doing. 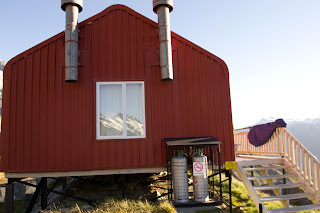 While we were uncertain of just how much injury John had taken, he seemed fine to travel so we traveled glacier style back to Colin Todd hut for first aid treatment. After a few hours of recovery for all of us we decided that we were up to following our original plan of heading over the quarterdeck and down. 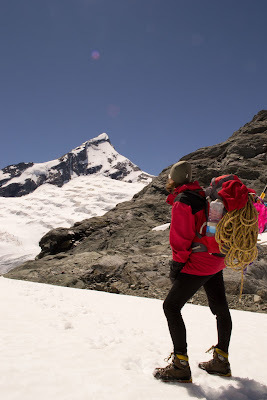 John had lost one of his bottles and I hadn't bought a very big one so our main concern for crossing the Bonar glacier was actually having enough water! 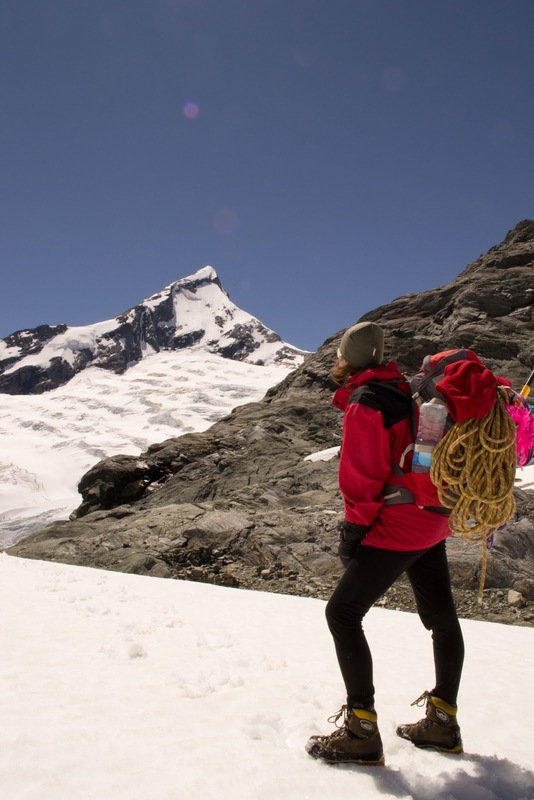 It was unbelievably hot, especially when you take our rather heavy packs into consideration. 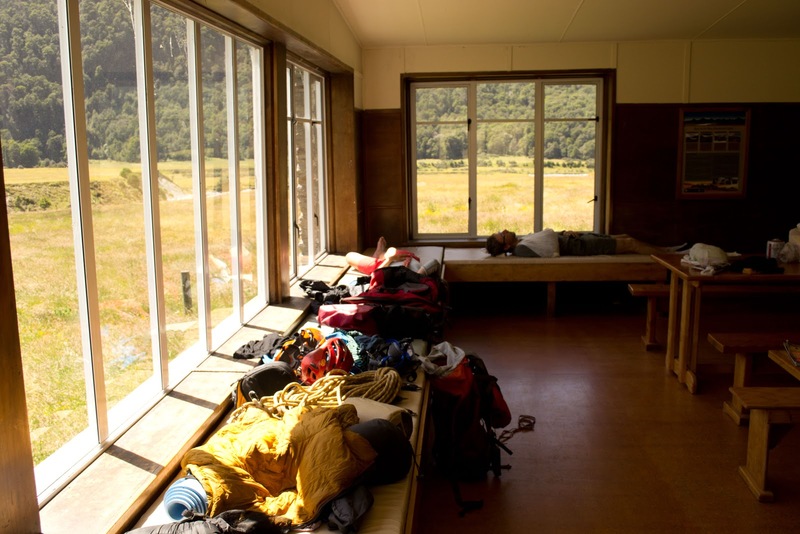 It was many hot hours before I took this photo looking back to Mount Aspiring from the Quarterdeck. From there it was a quick decent down to French Ridge Hut for dinner. John's shoulder wasn't ideal so Alice and I took "all the heavy stuff". 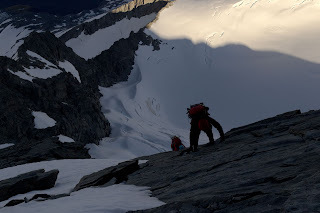 Somehow we decided to continue down and in the dimming light we decsended to Pearl Flat where we had stashed the tent. Alice and I decided that going lightless was more extreme so we actually left our headlights tucked in our packs until right down at the valley floor. No I can't explain why. Packing up our camp at Pearl Flat the next morning (after my first sleep in 40 hours). spreading out and having a rest at Aspiring Hut before driving south to Queenstown to meet back up with Mon and Oli at Ferg (of course). And that ladies and gentlemen was my sweet new years adventure! More photos from this trip are in my facebook album here. Here is a map of our route, or view Aspiring Trip in a larger map.